People mean exactly what they say; use their words to uncover deception. If you’re trying to figure out if your date is lying, pay attention to their verbs. Listen carefully to determine if a person’s statement is coming from memory or from imagination. Most statements should be written or spoken in the past tense because the incident has already taken place. In a deceptive statement, we may find some present tense language. When someone is telling you what happened or what was witnessed, the person should be speaking in the past tense. It doesn’t matter if something happened 10 minutes, 10 days or 10 years ago. The speaker should be using past tense verbs. In this statement, the person telling the story used past tense language consistently throughout her story. This would be an indication based only on the verb tenses she is telling the truth. To make a final decision as to the reliability of the statement, you would have to consider everything within the statement. Some people may opt to use a past tense verb with a present participle such as was walking. While the word “walking” is a present tense verb, the past tense verb “was” places the action in the past. Although this may be a truthful statement, a better statement would be to use the past tense form of the verb; “I walked to the park.” This may be giving you grammar flashbacks, but I wanted to point out that just because you see or hear a statement with a word ending with ‘ing’, don’t jump to the conclusion that it’s in the present tense … therefore: LIAR! Remember, in a deceptive statement we may find some present tense language. 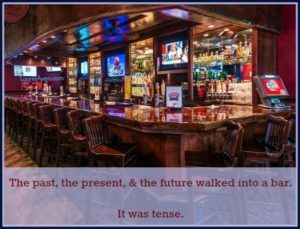 I’ll leave you with this bit of wisdom: The past, the present and the future walked into a bar. It was tense.